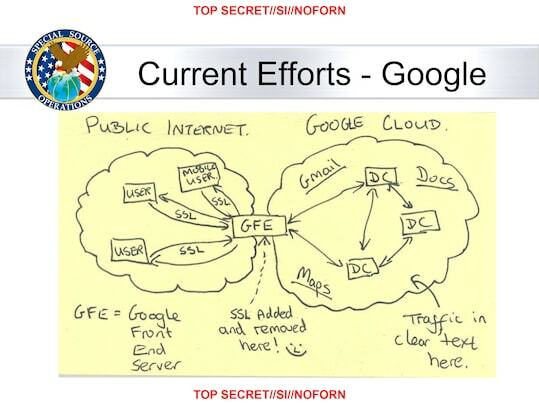 In this slide from a National Security Agency presentation on “Google Cloud Exploitation,” a sketch shows where the “Public Internet” meets the internal “Google Cloud” where user data resides. 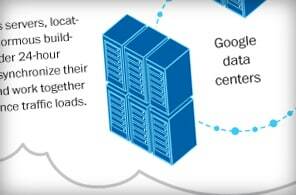 Two engineers with close ties to Google exploded in profanity when they saw the drawing. The National Security Agency has secretly broken into the main communications links that connect Yahoo and Google data centers around the world, according to documents obtained from former NSA contractor Edward Snowden and interviews with knowledgeable officials.By tapping those links, the agency has positioned itself to collect at will from hundreds of millions of user accounts, many of them belonging to Americans. The NSA does not keep everything it collects, but it keeps a lot. This NSA document describes a common problem of collecting too much information – and how the agency is attempting to control it. The NSA already legally compelled tech companies to give it data via PRISM. So why did it hack into data links? Read all of the stories in The Washington Post’s ongoing coverage of the National Security Agency’s surveillance programs. The NSA’s principal tool to exploit the data links is a project called MUSCULAR, operated jointly with the agency’s British counterpart, the Government Communications Headquarters. From undisclosed interception points, the NSA and the GCHQ are copying entire data flows across fiber-optic cables that carry information among the data centers of the Silicon Valley giants.The infiltration is especially striking because the NSA, under a separate program known as PRISM, has front-door access to Google and Yahoo user accounts through a court-approved process.